Got wood? If so, you'll never need to carry stove fuel again with the Hexagon Backapacking Wood Stove. Uses easy-to-find, renewable fuel wherever your travels may take you. Basic fire skills are needed. 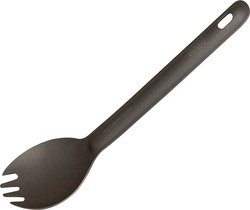 Available in stainless steel and ultralight titanium. anywhere in your pack. It fits a 32 oz. water bottle inside to make packing even easier! 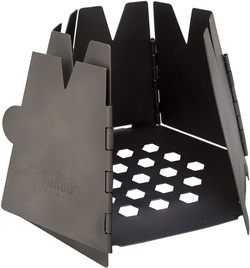 Topped off by the Vargo original strainer lid with heat-resistant knob, this is an essential piece of cookware you won’t want to leave home without. 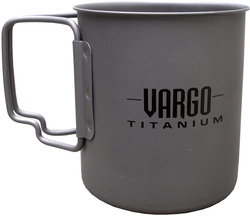 The 450 ml Vargo Titanium Travel Mug is a great companion both on and off the trail! Whether your journey includes sweeping mountain vistas, chatting with friends at the local coffee shop, or reading the paper at your kitchen table, its folding handles, titanium construction, and 450 ml capacity make it large and small enough to go where you do. And its stay cool rim won’t burn your lips while drinking your coffee or tea. no longer have to worry about leaching chemicals or harmful side effects. Titanium does not react to human fluids, so over time it will remain 100% safe. Drink with confidence and be the envy of your friends with the sweetest water bottle on the market.